Our traditional elctronic cricket scoreboards with wooden fascias offer an aesthetically pleasing finish with superior security. We do not surface mount the equipment on a plywood sheet, instead our fascias include impact resistant glazed apertures behind which the displays are mounted. This gives both protection and an antiglare finish. We also offer the option of a clear glazed scorer’s window which can be removed when required. Fascias are finished in black acrylic or plastic coated to give long lasting protection. The signboards are removable so there is no need to reletter when the fascia is repainted. 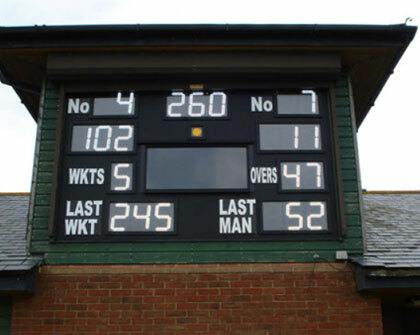 If a club has an existing scorebox with a sound structure, it can normally be simply fitted with a new fascia. We are happy to design and fit the fascia, or we can provide detailed drawings for your own carpenters to fit, thus saving you money which could be better spent. ESU offers you a greater choice of display technology. The scoreboard can use electromechanical digits or LED displays in seven segment or dot matrix format and in a choice of colours to produce the optimum solution. Our representatives will work with you to ensure that we provide the best design solutions for your needs at a price you can afford. Clubs should speak to ESU and their local authority planning department before embarking on a new build project. We recommend construction is undertaken by a local contractor, albeit in conjunction with our own carpenters.